BUENOS AIRES 2018: Australia’s outstanding year in global athletics concluded in Buenos Aires on Wednesday after a campaign filled with personal bests and top-10 finishes. The 16 and 17-year-old athletics team performed remarkably on the world stage, with five medals. In Buenos Aires, where there were 700 athletes representing 126 nations, eight Aussies were top-5 and all the Australians were top-10 in events which had fields ranging in size from 25 to 40 competitors. Australia was seventh on the medal table, ahead of athletics powerhouses America, Germany, France and Japan. From her first step on the track, Opening Ceremony flag bearer Keely Small was peerless winning both stage 1 and 2 of her 800m events. Showing maturity beyond her years, she employed different tactics in each race for comfortable victories. She clocked times of 2:04.76 and 2:05.68 finishing overall three seconds ahead of her competition. In the 100m hurdles, Sophie White claimed a second and a third place, to clinch the silver medal overall, behind America’s Grace Stark, but 0.01 seconds ahead of Ackera Nugent of Jamaica. In her stage 2 race, she clocked 13.01, smashing the national under-18 record held jointly by herself and Sally Pearson, only to have it deemed ineligible for over the limit wind assistance (+2.6m/s). Another athlete that could be eyeing off a record is long jumper Josh Cowley who continued Australia’s strong tradition in the men’s long jump on the global stage. He leapt 7.82m and is closing in on the national under-18 record of 8.01m. During his Buenos Aires competitions he added a staggering 30 centimetres to his personal best across his two competitions to win the silver medal - tantalisingly just one centimetre short of the gold. He arrived with a best of 7.52m, opened his campaign with 7.69m, then won stage 1 with a windy 7.71m. In stage 2 he extended that lifetime best to 7.82m and into the top-10 Australian juniors all-time. Oscar Miers, like Cowley, destroyed his pre-Youth Olympic Games best of 2.14m in the high jump. Overcoming a head knock in stage 1 which required a dash to the village for a medical check, three days later he returned and just went higher and higher, exceeding all expectations. Miers cleared two PBs at 2.16m, then 2.18m. Then in a tactical move, passed 2.20m, but extraordinarily cleared 2.22m – an eight centimetre PB. He would eventually claim the silver medal, finishing behind China’s Chen Long. 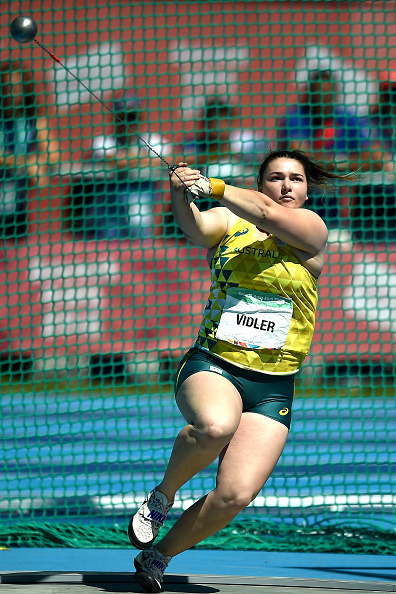 Throwers Sally Shokry and Rochelle Vidler overcame nervous starts with a few fouls in their respective throwing events, closing the competition with top-10 finishes. Shokry, reached a best of 46.79m in the discus, not far short of her 49 metres personal best, which is close to the best of world champion Dani Stevens, an occasional training partner, at the same age. NSW South Coast’s Jaylah Hancock-Cameron stood up to the challenge in her 1500m and cross country events to win a stunning silver medal. She setup her medal prospects with a lifetime best of 4:18.44 in the 1500m where she placed second to Kenya’s Edina Jebitok. In warm conditions, she placed fourth in the cross country, which was enough to collect the silver medal overall. Distance runners Luke Young and Jamie Hiscock competed in the 1500m and 2000m steeplechase respectively, before they went off track in stage 2 to race the cross country. On the track, they were just outside their PBs, then in the heat at the cross country they lined up against the 1500m, 3000m and steeplechaser athletes, both finishing 5th overall in their own rankings. Managing a hamstring injury that occurred just prior to departure, 400m hurdler Tom Throssell overcame that challenge to initially clock 54.22. Three days later in his stage 2 race, to the cheers of the full Australian team, he took the win in the B race in a terrific time of 53.27, to finish 8th over the two stages. His goal was top-8 and 800m runner Anthony Vlatko set that up in his stage 1 race with a quick time of 1:51.34, his fourth fastest ever. In stage 2, in the A heat, he controlled the race from the gun, leading for most of the first lap. His ‘leave it all out there’ effort took its toll, finishing eighth, but pleasingly he achieved his goal of eighth overall. A coaching change and injury threw up challenges for sprinter Keegan Bell in the leadup to his international debut, but he didn’t allow that stopping him being very competitive. Bell finished ninth overall in the 400m amongst the 25 competitors.